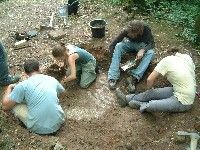 At the beginning of 2007, Surrey County Archaeological Unit was approached by Surrey's Youth Development Service with a request: could we act as advisor's to a very excitable bunch of enthusiastic young people whilst they undertook an archaeological project of their own? We were happy to, and so started months of project planning and preparation. As this was to be their own project, the young people had to find a suitable site, carry out a desk-based assessment and plan the aims of the project. The group already had a site in mind, the High Ashurst Outdoor Education Centre near Mickleham. It is well known that a house once stood close to the now converted coach house, but the group wanted to discover what was now left of it, and more about the history of the site. The earliest reference to the High Ashurst Estate is to John Morsfold, who inherited area, called 'High Ashes Farm' in 1706. By 1740 it was owned by Mr Richard Rougier, and in 1827 the farm was sold twice. From 1836 to 1918, the estate was the seat of the Earl of Harrowby. The owner of the house was William Strahan, descendent of the William Strahan (1715-1785) who printed Johnson's Dictionary. In 1918 the 5th Earl sold the estate, and then the surrounding lands in 1921. Between 1921 and 1924 the house was utilised as a lodgings by the Young Women's Christian Association. Shortly after the house became Wentworth Hall, a school for ladies. Wentworth Hall was a private boarding school in Islington, which needed room to expand and escape the confines of London. It boasted a timetable with such disciplines as elocution and housewifery. Like many large properties in Surrey, the estate was used as a base for Canadian military personnel during World War II. After the war, the house fell into disuse and was pulled down between 1961-73. A week of fieldwork at the site began on 3 September 2007. Using plans of the house located during their research, the young people chose areas to investigate, taking into account the evidence that still survives on the ground. This includes cellar tunnels for pipe work, an outside staircase, a garden pathway retaining wall and the oral history evidence for a mosaic. 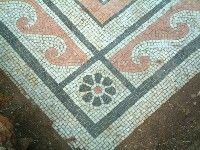 According to staff at the Outdoor Centre, a mosaic (thought to belong to the entrance hall of the house) had been exposed to the elements and visiting school groups for many years, until little bits of it started to disappear, so was then covered with rubble. Finding and recording the state of preservation of the mosaic was to be one of the main aims of the 2007 team. Trench 1 over the position of a bay window in the dining room. The slate damp-course was uncovered. Trench 2 was located where a small part of wall was exposed. It was thought that this could be the foundation for the south-west corner of the house, but turned out to be part of a small garden wall, in alignment with six alder trees marking the main western driveway. Trench 3 was located over the eastern edge of the house, close to the cellars and toilet blocks. This trench in particular suffered from tree root action, but evidence for a wall and a possible cellar windowsill was found. Trench 4 was located just below Trench 2, investigating a possible garden step, and one of the stone bollards (four were located in this area), which were presumed to be the driveway markers as seen in an 1881 drawing of the house. Trench 5 was positioned to uncover the entrance hall mosaic. People who had seen the mosaic when it was previously uncovered described it as being fairly small, black and white in colour and with square blocks of pattern. After the team had shifted a fair amount of brick rubble, what was revealed came as a bit of a surprise: a pink, blue and white tiled mosaic with wave and Fleur de Lis patterning! Trenches 6 and 7 were excavated to the south of the mosaic to try to locate the position of the front door. The pathway, which is known to run across the length of the house was located in Trench 6, and to the north Trench 7 picked up a stone block, possibly a door step. During the week Surrey Finds Liaison Officer David Williams from the Portable Antiquities Team visited the team, along with local metal detector, John Cole, who helped the group locate several interesting finds including coins, a button and an abundance of metal curtain hooks! The Discover High Ashurst group followed their fieldwork week with several days of post excavation work. This involved washing and packing the finds from site, which included a large quantity of brick rubble, window glass, plaster and iron objects. The project continued until 2010 when work then concentrated on turning the results of the dig into a display, with interpretation boards for the site. Part of the site was already fenced to create a small heritage enclosure, which Surrey Outdoor Learning Development hope to incorporate into visits made by school and youth groups to High Ashurst Outdoor Education Centre. This will not only enhance the overall experience of visitors to the centre but also provide on-going maintenance activities for Surrey Youth Justice. If you are interested in taking part in a future project or would like further information on other Community Archaeology projects in Surrey please contact the Community Archaeologist on tel: 01483 518737 or email: education.scau@surreycc.gov.uk.